Today in Masonic History Elmer Austin Benson passes away in 1985. Elmer Austin Benson was an American politician. Benson was born on September 22nd, 1895 in Appleton, Minnesota. He would study law at the St. Paul College of Law, later it was renamed to the William Mitchell College of law. He would spend a year in the United States Army during World War I. When he returned he would never practice law. Instead of going into law, he entered the banking industry. Benson was a member of the Minnesota Farmer-Labor Party (FLP). FLP was one of the first successful statewide third party political movements. It was a far left organization that was popular during the Great Depression and into the 1940's. It was through the FLP that Benson would become associated with Governor Floyd B. Olson. The two were close political allies. Olson appointed Benson first as the State Commissioner of Securities. 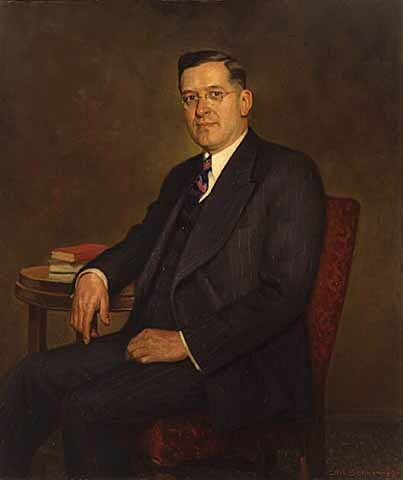 In 1935, Olson appointed Benson to fill the United States Senate seat that had been vacated due to the passing of Thomas D. Schall. He would only serve the one partial term in the Senate. In 1936, Olson passed away and the remainder of his term was filled by the Lieutenant Governor, who refused to run for reelection in November of 1936. Benson ran instead and was successfully elected as Governor of Minnesota in the largest margin in state history. He would serve one term as Governor, failing to get reelected in 1938. He was defeated with a record margin. This was seen as the end of the FLP in Minnesota. Benson would stay active in politics through the 1940's and beyond, he would never be elected to another political office. In 1944, the FLP merged with the Democratic party to form the Democratic-Farmer-Labor Party (DFL). In 1946 the party split into two factions with Benson in control of one group of the party and Hubert Humphrey on the other. In 1948, Humphrey's faction successfully wrested control from Benson faction. In the end Benson and his supporters would leave the DFL. Benson would briefly join the 1948 Progressive Party before ill health would drive him from public life. Despite the unceremonious end to Benson's career he would live to see many of his radical ideas become law. He passed away on March 13th, 1985. Benson was a member of Appleton Lodge No. 137 in Appleton, Minnesota.